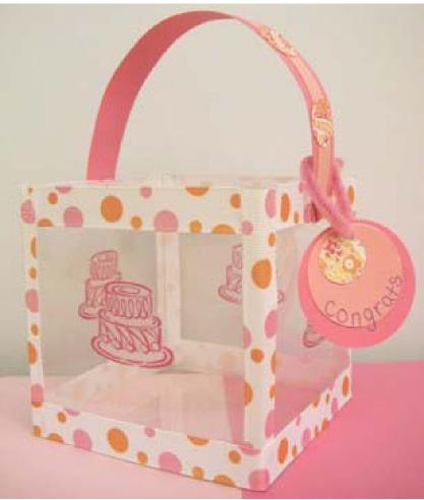 Project Description: Present your guests with these adorable favor holders made with Grafix Craft Plastic. Great for weddings or birthday parties! Cut 5 Craft Plastic squares measuring 6×6”. Lay 4 squares side by side, apply a 1/2” strip of Double Tack to each seam and cover the Double Tack with ribbon. Fold the squares into a cube and secure with Double Tack and ribbon. Glue the last square to the bottom of the cube. Cover top and bottom edge of the cube with ribbon and secure with Double Tack. Create cake stamp Rub-Onz according to instructions on Rub-Onz package and apply to the outer edges of the cube. Cut 2 strips of pink card stock to the desired handle length, making one strip slightly thinner than the other. Layer and glue card stock strips together and secure to sides of cube using a decorative brad. Punch circles out of patterned paper and glue to decorate handle. Punch circles out of card stock, layer and glue together to create a tag. Write a sentiment on tag, hole punch and secure with a chenille stem. Fill basket with candies or goodies and give to your guests!